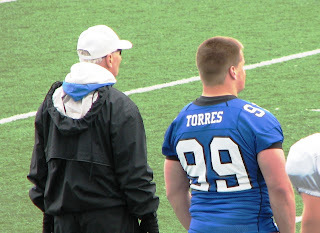 Even though Trev can’t play yet, we wanted to see the EIU Spring Game. Trev invited 4 friends from Quincy to travel to Charleston with us. 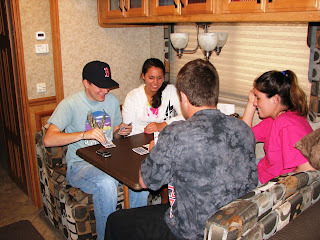 It rained for most of the 200 mile trip over so the kids got a card game going to pass the time. We didn’t get to the campsite until nearly dark and it was pouring rain. Trev invited several more football players and ladies over to the campsite to enjoy what’s become the traditional Friday evening sloppy joes, nachos and baked beans. With the weather, we ended up with 12 people eating in the motorhome. 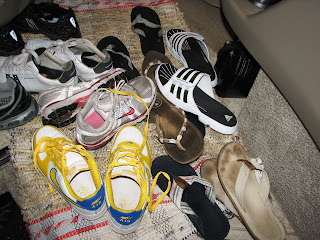 The rule with the mud outside was no shoes in the RV so we had quite a collection by the door! Saturday morning, Ken got this shot of my Nordic Track ski’s to show his handywork making me a brand new ski to replace the one we busted last weekend. I’m pretty lucky to have a guy who can fix just about anything I break without spending much to do it. We took our time getting ready for the day, taking the dogs for a walk between showers and then making a Walmart run. I’d gotten a bit light headed during my 33 minute Nordic Track jaunt and so figured I’d better check the old BP again which we could do at Wal-mart. Sure ‘nuff it was 146 over 106. Guess I’m going to have to give in and go on medicine since diet and exercise don’t seem to be doing the trick. The girls were really perturbed with me when I backed out on going out bar-hopping with them Saturday night considering that smart until I got myself healthier! 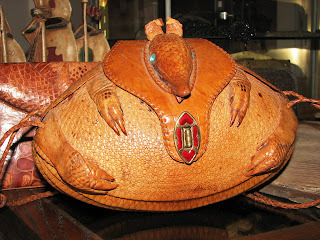 Of course, bar-hopping with a bunch of college girls is probably never going to be heathy for a 50-something like me! 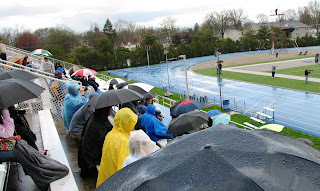 The game was at 1pm Saturday, with diehard fans sitting through rain for most of the game. Since he has a concussion, Kevin got to spend the game working the sideline down marker…obviously really excited with the assignment. Trevor switched numbers this year so he’s now #99. Here he is next to Coach Spoo. Unfortunately his new shirts aren’t in yet so he was Torres for the afternoon. He is thrilled that he has made it to his weight goal of 280 but is very anxious to get to his doctor appoint Monday hoping for a release to start weight lifting again. He really wants to get his upper body strength back as soon as possible. We really hope he’ll take it slow to insure no further damage. 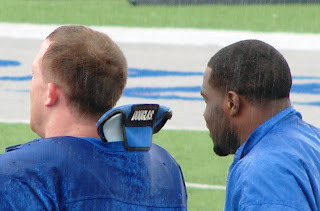 Even though last year’s team captains have finished their time of the EIU field, they were fixtures on the sideline. Here Don-Don, right, is giving Pug sideline advice. Don-Don spent 2 months at NFL combines earlier this year and has some prospects in that area. If only a few inches taller, he’d be high draft pick material but like Trev, his lack of height doesn’t help him. He also spend some one-on-one time with Ken and me at the RV and filled us in on some other opportunities including an upcoming interview with the Secret Service. As his adopted ‘football parents’ we have high hopes for him! Upper right in black is Tim Kelly, the defensive line captain, and Trev’s current room-mate, keeping close tabs on defense. 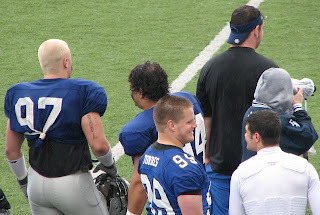 Trevor’s roommates for next year, Jeff Sobol, 97 and Andre Lima, 94 were getting lots of playing time with Trevor on the sidelines. There’s a story behind Trev’s laughing in this picture. Hockaday, in white, had been in as quarterback and got his bell rung big time. After realizing that he just kept asking Trev that same question again and again, Trev kept close tabs on him on the sideline, after they got his jersey off him and helmet out of his hand so he couldn’t go back in. Can you say concussion….arghh…not good in the spring game already? 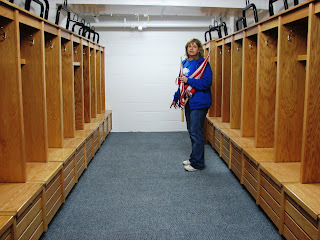 After the game we went in to the soon-to-be new locker room for a tour. They still need to paint a big panther on the white wall behind where I’m standing. The lockers are all oak. It will be pretty cool to see this pre-game with their pads all lined up on the black piping above and all the shiny clean jerseys and helmets lined up. 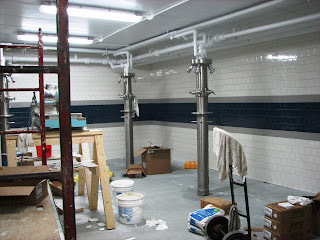 Looks like quite a bit of work still to be done in the shower room to be ready for use in 2 weeks. After the game we took we took Trev to Lincoln Gardens for late lunch/early dinner then he was off to pick up one of the 3 kegs they had on order for the party on tap (literally) at their house that evening. Ken and I begged off joining them for the festivities and so by 5pm had the rest of the day to ourselves. The timing was great since the EIU baseball team had a rain delay and so we were able to see most of the game we thought we would miss. One of their pitchers, Brian Morrell, went all through grade school and high school with Trevor and in fact, Trevor was his catcher for several years, while Tim Morrell and Ken spent many years together coaching the boys in baseball as well as soccer. 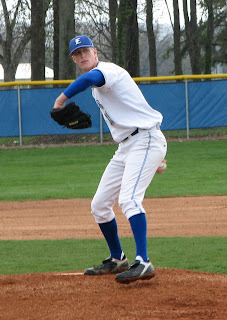 Brian came in as reliever in the 3rd and pitched seven innings of shut out ball. For you a non-baseball person that means no runs were scored once he started pitching. 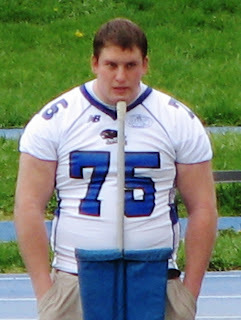 The score was something like 18-2 EIU beating Jacksonville State. For you Quincyans, Brian has signed to be back with the Quincy Gems this summer so make some plans to get out and enjoy some great local baseball. 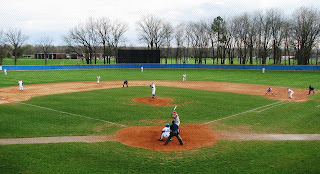 EIU has a really nice baseball field, that must have great drainage considering it was in really good shape after all the rain. 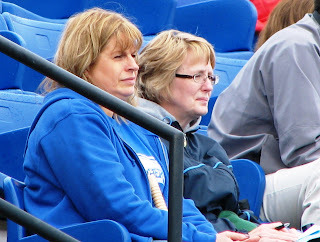 It was like old times for Amy and I as we dried out together in the stands, while Ken and Tim were positioning themselves around the park to get good pictures and the best vantage points to share their running analysis of the game and Brian’s pitching. 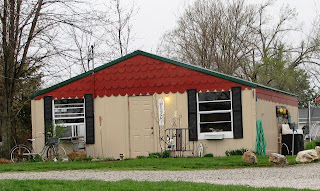 Since the sun had come out, Ken and I decided after the game to drive by Lincoln Resort 3 miles east of Charleston to see how they were doing getting the RV park and cabins in place. Unfortunately they have not even broken ground yet on that phase of the resort so doesn’t look like we will be able to plan on trying that spot for the coming football season. 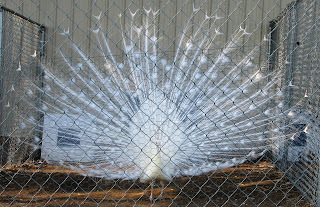 Our timing was good though since on the way out I was able to get this picture of one of their white peacocks showing off his plumage. Saturday night was gorgeous so Ken and I enjoyed several hours by the campfire, watching the fool moon rise as a huge flock of turkey vultures came in to roost in nearby pines. We were both in bed by 10:00 and slept great. Sunday morning was beautiful so Ken and I took our time with a pot of coffee, enjoying some quiet time together under the awning before breakfast and packing. A really nice benefit of staying in site 12 is that it is long enough and wide enough for Ken to pull the motorhome up to the front of the site and back the jeep back where he can hook it up before every pulling out of the site. There is also plenty of room for the dogs and for our Friday night dinner visitors to congregate. Trevor called just before noon and had his crew fed breakfast and ready for the trip back. We picked them up from the house and some slept while others watched movies on the bedroom TV. We were home by 5pm. Ken and Trev drove to Columbia, MO Monday for an early afternoon appointment with Dr. Smith. The great news was that all is healing very well and Trevor is released to VERY SLOWLY begin weight lifting again to work back to full strength. Ken and Trev then drove all the way back to Charleston. It was a gorgeous day so most of this trip was with the top down and on the Audi, and their favorite blues CD’s cranked up. After supper, rather than spend the night in Charleston, and since the weather was so gorgeous, Ken did the trip back to Quincy and was in town by 11pm....long but very good day! Next weekend is the spring game at Northern Illinois University where Kyle is finishing school. Trevor knows players on that team as well and so will spend the weekend Kyle...and who knows where Mom and Dad will be next weekend...but we'll let you know! 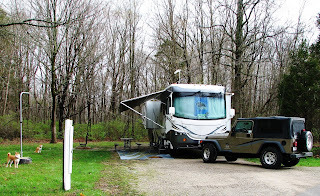 Hi, this is Cindy, on ‘blog’ duty again now that we are back in to camping season and Ken is driving while I’m blogging. This was our first weekend to be with the Archway Coachmen Club since last summer and we were really looking forward to it. We began to have second thoughts as we headed toward Mid-Missouri with Ken battling 40 mph wind gusts. Ken took it slow, and we took a break in Laddonia to get 46 gallons of diesel at $3.99 per gallon, no cheap break! 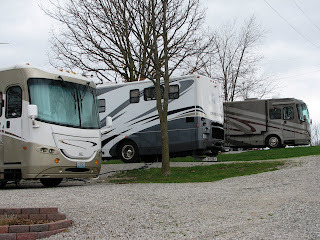 We pulled in to LazyDays Campground, in Danville, Mo, at 5pm. Kim, the owner, had us a spot reserved between the other two Sportscoaches in the club. The weather was really cold and ugly, so after setting up and walking the dogs we were thrilled to get to the club festivities in the warm and cozy club room. 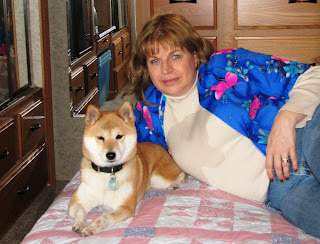 Kim told us that she does close to 50 RV club events a year. She has two different buildings of different sizes to accommodate indoor activities for groups. 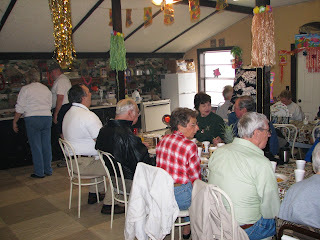 With a full kitchen and clean heated shower/restrooms right across the road, it makes for a really good gathering spot. Friday night was wine-tasting and snacks. Since we are the only members from Illinois we brought Illinois wines. One was a Cynthiana. 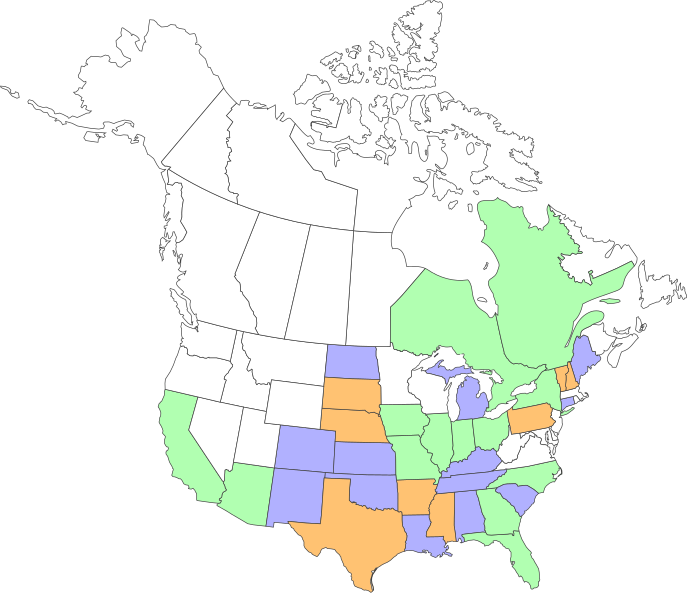 I figured anything with that name from Illinois had to be great, right! It was actually very good, although you have to like dry reds like Ken and I do to like a wine from Cynthiana grapes. The other was a Vignoles that we’d picked up on the Illinois Wine Trail on our last outing during the football playoffs at Southern Illinois University. It’s a sweet dessert wine. It was great having full hookups since I was able to exercise and then take long showers, Friday night and Saturday morning. The club officers treated us to a breakfast of sausage and French toast followed by a club meeting. This group has been together 11 years. They plan monthly RV outings April through October and then have restaurant outings monthly during the winter months. We really don’t get to spend lots of time with them since their May outing is on Mother’s Day and September and October are football season. Since the group is St.Louis based we don’t do the winter outings since 4 hours is a lot of driving to go out to eat! Bob and Cindy Byrne had arrived a day earlier and suggested that if Ken and I were simply looking to do a little local sightseeing for a few hours, we should head down to the next exit and visit Williamsburg, Mo. This turned out to be excellent advice. Williamsburg is home to Crane’s General Store. 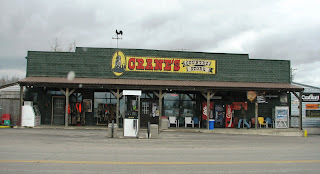 This store has been in business at this location and run by the same Crane family since the 1800’s. 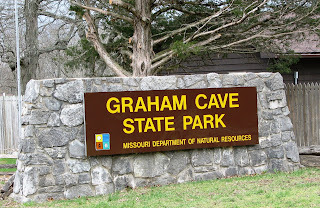 On the way back, we drove through Graham Cave State Park, across Interstate-70 from the LazyDays Campground. 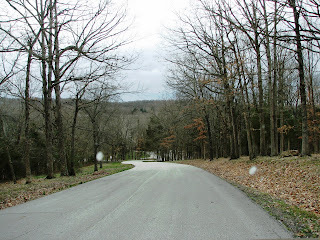 This state park, like all we’ve seen in Missouri appears well maintained with windy, scenic drives. Unfortunately their didn’t appear to be many long level campsites and while their were a surprising number of campers, the only motorhome there belong to the campground hosts who had the only large level full hookup site we saw. If we come down here on better weather we’ll consider bringing a picnic lunch over here and explore the gave which appears to be only a short walk from the parking area. The winds were still whipping and the temperature hovering just above 40 degrees when we arrive back at the RV mid-afternoon. After a brisk dog walk, we decided it was naptime. Sox insisted that with our ceramic heater keeping the bedroom especially toasty, the bedroom should be the ‘girls’ nap room, while Ken and Ditka sacked out on the coach and watched a bit of golf on TV—with their eyes closed. 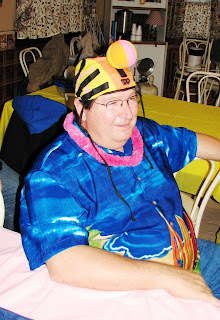 Saturday evening was Hawaiian Luau night. The potlucks with this group are fabulous, with know lack of awesome Rv cooks among the group. The club provided the meat. We can highy recommend based on that both the spiral cooked ham from Aldi’s and the pre-cooked beef brisket from Sam’s Club. These turned out to be really perfect selections for this kind of get together. 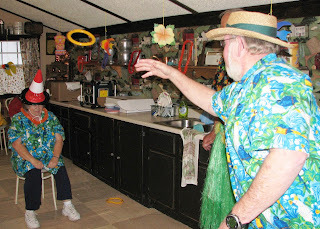 A game called butthead, where your spouse put on this strange swimcap looking cap with Velcro strips and you get points by throwing balls and trying to get them to stick to their head. Sunday morning was still spitting snow when we did the first morning walk with the dogs. We joined the group in the club room for coffee and donuts. Then went back to backup and unhook. There was enough leftovers from the Luau that we got together again for lunch before pulling out. Ken had Kim fill us up with propane since she had a very convenient spot for us to do that. We paid $3.00 for propane including tax and were surprised we only needed 19 gallons considering the amount of time we’ve had to run the heating since last fillup. 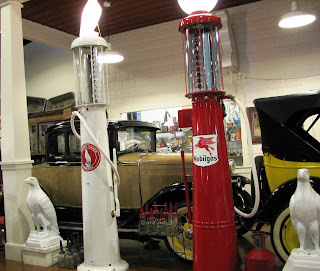 It was at the propane station we encountered our screw-up for the weekend. The rear slide did not appear to be totally in. 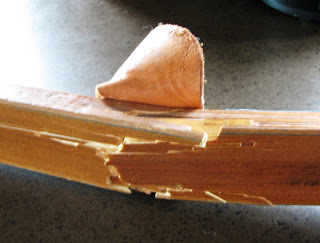 Ken brought it the rest of the way in but then realized that the culprit was one of the ski’s from my Nordic Track. Before we could remedy the situation, the tension of the ski got to be too much. It sounded like a gun going off as the ski snapped in two. Now Ken has something to fix before our outing next weekend. 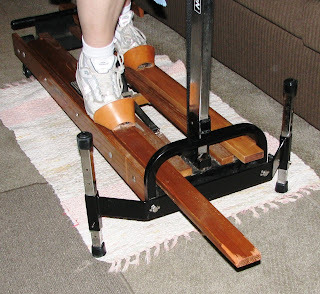 Of course, I can’t use this as an excuse for not exercising since he was good enough to get me a second ski machine at home. As we crossed the Mississippi River at Hannibal, the sun broke through the clouds for the first time all weekend. It was a wonderful weekend, with wonderful people. Hopefully our adventure to Charleston next weekend will be the same, but with wonderful weather as well!